On Wednesday's show, Olbermann had already come close to suggesting that some of Bush's actions could be viewed as terrorism. The Countdown host not only referred to the government "becoming just a little bit like the terrorists," but he also labeled some of Bush's "invocations" as "terroristic," and compared the wish of a 9/11 planner to end America to what President Bush himself "has wrought." Olbermann: "One of the terrorists believed to have planned the 9/11 attacks, you told us yesterday, said he hoped the attacks would be the beginning of the end of America. That terrorist, sir, could only hope. Not his actions nor the actions of a ceaseless line of terrorists, real or imagined, could measure up to what you have wrought...These things you have done, Mr. Bush, they would constitute the beginning of the end of America." Keith Olbermann: "And about the Republican scare commercial. Does it not meet the dictionary definition of terrorism? A 'Special Comment,' Scare Tactics: How the Republicans are willing to do the terrorists' work for them by trying to terrify Americans. 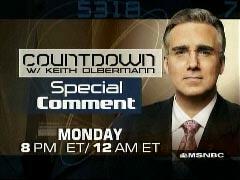 Monday here on Countdown, 8 and Midnight Eastern, 5 and 9 p.m. Pacific."